"As Mary is the treasurer and dispenser of the gifts and graces of the Most High God, she reserves a choice portion, indeed the choicest portion, to nourish and sustain her children and servants. They grow strong on the Bread of Life; they are made joyful with the wine that brings forth virgins. They are carried at her breast. They bear with ease the yoke of Christ scarcely feeling its weight because of the oil of devotion with which she has softened its wood,"
"Put your sins in the chalice for the precious blood to wash away. One drop is capable of washing away the sins of the world. "The Eucharist is connected with the Passion. If Jesus had not established the Eucharist we would have forgotten the crucifixion. It would have faded into the past and we would have forgotten that Jesus loved us. There is a saying that to be far away from the eyes is to be far away from the heart. To make sure that we do not forget, Jesus gave us the Eucharist as a memorial of his love,"
"Our Redeemer ever present in the most Blessed Sacrament, extends His hands to everyone. He opens His heart and says, 'Come to Me, all of you.'" - St. Raphael Kalinowski, O.C.D. "Peter, James and John witnessed the Transfiguration of Christ on Mount Tabor. The whole world will witness the glorious transfiguration of Christ in the Blessed Sacrament. It will have the exact opposite effect of the bombing of Nagasaki. At the transfiguration of Christ in the Blessed Sacrament, there will be an explosion of divine energy which will release the power of His love and renew the face of the earth. Then the world will see Real Power! All will be made well. All will belong to His Heart. All will be made one. "In the meantime, there are five graces we receive each time we visit Jesus in the Blessed Sacrament. By His glorious wounds we are the ones who are transfigured and changed through His healing love. Restoration, sanctification, transformation, reparation and salvation are the graces being poured out graciously upon us with each holy hour we make. "Like Peter... this is why we should exclaim in His Divine Presence, 'Lord, how good it is for us to be here!'" "He who receives Communion is made holy and Divinized in soul and body in the same way that water, set over a fire, becomes boiling... Communion works like yeast that has been mixed into dough so that it leavens the whole mass; ...Just as by melting two candles together you get one piece of wax, so, I think, one who receives the Flesh and Blood of Jesus is fused together with Him by this Communion, and the soul finds that he is in Christ and Christ is in him,"
"Once the army of men who hated Christ came to Assisi. They meant to destroy the city. St. Clare carried the Blessed Sacrament outside the convent. Only her sisters were around her. But the great army saw her coming. They turned and fled in panic." - Rev. Daniel A. Lord, S.J. "The Eucharist is that love which surpasses all loves in Heaven and on earth,"
"The Eucharist is the Sacrament of Love; It signifies Love, it produces Love,"
"In the Eucharist is all the power that created the universe and all the love that redeemed it!" "Adorned with heavenly power you shine forth like the sun among the saints." "It was Mary who first adored the Incarnate Word. He was in her womb, and no one on earth knew of it. Oh! how well was our Lord served in Mary's virginal womb! Never has He found a ciborium, a golden vase more precious or purer than was Mary's womb! Mary's adoration was more pleasing to Him than that of all the Angels. The Lord hath set His tabernacle in the sun, says the Psalmist. The sun is Marys heart," and "Mary is the aurora of the beautiful Sun of Justice." "Happy are you, holy Virgin Mary, and most worthy of all praise, from your womb Christ the Sun of Justice has risen." "Let us give ourselves to the Immaculata [Mary]. Let her prepare us, let her receive Him [Jesus] in Holy Communion. This is the manner most perfect and pleasing to the Lord Jesus and brings great fruit to us." Because "the Immaculata knows the secret, how to unite ourselves totally with the heart of the Lord Jesus... We do not limit ourselves in love. We want to love the Lord Jesus with her heart, or rather that she would love the Lord with our heart." "All for the Eucharist; nothing for me,"
"Father, I am hungry; for the love of God give this soul her food, her Lord in the Eucharist,"
"...Such visits are a proof of gratitude and expression of love, an acknowledgment of the Lord's presence." "My eyes, I have filled with Jesus upon Whom I have fixed them at the Elevation of the Host at Holy Mass and I do not wish to replace Him with any other image,"
"...Mary continues to stand alongside her Redeemer-Son in the sacrament of the altar. It is consoling to recall that she who bears the title 'Mother of Fair Hope' keeps perpetual vigil before the Blessed Sacrament, ever ready to encourage her pilgrim children en route to the glorious world of the resurrection. In the Salve Regina we 'poor banished children of Eve' hail the New Eve, mother of the Eucharist, as 'our life, our sweetness and our hope.' And we implore her to 'show us, after this exile, the blessed fruit' of her womb. "This our heavenly mother will certainly do, lovingly and graciously. But already here and now, that is, during our exile in this 'vale of tears,' she untiringly shows us the blessed fruit of her womb integrally present in the sacrament of the altar. As his handmaid and herald she urges us to draw ever closer to him. For not only is He the source of life and holiness; He is the pledge and pattern of our bodily resurrection when the new world finally dawns." - Fr. Richard Foley, S.J. "Only through the Eucharist is it possible to live the heroic virtues of Christianity: charity, to the point of forgiving one's enemies; love for those who make us suffer; chastity in every age and situation of life; patience in suffering and when one is shocked by the silence of God in the tragedies of history or of one's own personal existence. You must always be Eucharistic souls in order to be authentic Christians,"
"O King of glory, though you hide your beauty, yet the eye of my soul rends the veil. I see the angelic choirs giving you honor without cease,"
"Do you wish to learn the secret of true Eucharistic prayer? Consider, then, all the mysteries in the light of the Blessed Sacrament. It is a divine prism through which they can all be studied. The Holy Eucharist is, indeed, 'Jesus Christ, yesterday, and today, and the same forever' (Heb 13:8). In this Sacrament He glorifies all the mysteries of His life and prolongs, as it were, the exercise of all His virtues. The Eucharist is, in a word, the great Mystery of our faith to which all Catholic truths lead,"
"I beg you to show the greatest possible reverence and honor for the most holy Body and Blood of our Lord Jesus Christ, through whom all things, whether on earth or in heaven, have been brought to peace and reconciled with Almighty God,"
"It is the Sacrament of Love that excites the soul to ardent prayer. It stirs up the virtue of impetration and, as it were, forces God to grant our petition. It deepens the abyss of humility, above all it enkindles the flame of love in the heart; hence the Sacrament is the Gift of gifts, and the Grace of graces,"
"All my sermons are prepared in the presence of the Blessed Sacrament. As recreation is most pleasant and profitable in the sun, so homiletic creativity is best nourished before the Eucharist. The most brilliant ideas come from meeting God face to face. The Holy Spirit that presided at the Incarnation is the best atmosphere for illumination. Pope John Paul II keeps a small desk or writing pad near him whenever he is in the presence of the Blessed Sacrament; and I have done this all my life  I am sure for the same reason he does, because a lover always works better when the beloved is with him." "O God-Man present in this sacrament for me  what a comfort, what a privilege to know I kneel before God! And to think that this God loves me!... Mary, my mother, help me to love him in return,"
"On her return to Lisieux [from her visit with the Pope in Rome], she sent her gold bracelet to the chaplains of Montmartre so it could be melted into part of a great monstrance  a gesture that clearly expressed Thereses desire to keep watch day and night close to Jesus in the Eucharist." 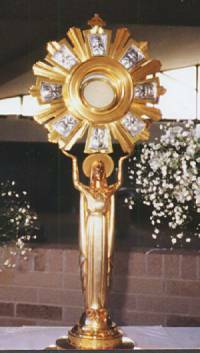 The monstrance was built and placed in Le Sacre Coeur in Paris where Jesus in the Most Blessed Sacrament is adored perpetually  day and night  to this day. In the fullness of love for your creature." "Beneath the Eucharist's sacramental veils is the living fruit of Mary's womb,"
"We have him [God] before our eyes, masked in the sacred Host,"
"O most sacred, most loving heart of Jesus, thou art concealed in the Holy Eucharist, and thou beatest for us still.... Thou art the heart of the Most High made man.... Thy Sacred Heart is the instrument and organ of Thy love. It did beat for us. It yearned for us. It ached for our salvation. It was on fire through zeal, that the glory of God might be manifested in and by us.... In worshipping thee I worship my incarnate God, my Emmanuel,"
"Mary found again in the adorable Host the adorable fruit of her womb... and began in the Cenacle her new maternity at the feet of Jesus in the Eucharist,"
"She who received the seed of eternal glory Now dispenses grace, the seed of glory-to-come. My womb was the chalice of the impenetration of God That became the Incarnation of God and man,"
Pope Leo XIII says that the Eucharist is "a most divine gift proceeding from the very Heart of the Redeemer." "Evangelization through the Eucharist, in the Eucharist, and from the Eucharist  these are three inseparable aspects of how the Church lives the mystery of Christ and fulfills her mission of communicating it to all people.... In addition to the preaching of the message, the consummation of evangelization consists in the building up of the Church, which has no real existence without the sacramental life culminating in the Blessed Eucharist,"
"He who made thee is made in thee. He is made in thee through whom you were made.... Give milk, O mother, to him who is our food; give milk to the bread that comes down from heaven." "The Eucharist is source and pledge of blessedness and glory, not for the soul alone, but for the body also.... In the frail and perishable body that divine Host, which is the immortal body of Christ, implants a principle of resurrection, a seed of immortality, which one day must germinate,"
"When you look at the crucifix, you understand how much Jesus loved you. When you look at the Sacred Host you understand how much Jesus loves you now. This is why you should ask your parish priest to have perpetual adoration in your parish. I beg the Blessed Mother to touch the hearts of all parish priests that they may have perpetual Eucharistic adoration in their parishes, and that it may spread throughout the entire world,"
St. Francis of Assisi led his brothers in prostrating themselves and in proclaiming before every Church where Jesus in the Most Blessed Sacrament dwelt: "We adore Thee most holy Lord Jesus Christ, here in all Thy Churches, which are in the whole world, because by Thy holy cross, Thou hast redeemed the world." "The Eucharist flows from the Passion of Christ. When we come to the Blessed Sacrament WE COME TO THE CROSS. During our holy hour we lift up to the Eucharistic Heart of Jesus those souls in the most need of His mercy. "If we only knew the value of a holy hour we would never miss a single day without making one... Because the Cross is infinite in merit, there is no limit to the value of a holy hour." his members have made your wood more noble than precious pearls,"
"Every Mass is a memorial of that one sacrifice and that passover which restored life to the world. Every Mass puts us into intimate communion with her, the mother, whose sacrifice 'becomes present' just as the sacrifice of her Son 'becomes present' at the words of consecration..... At the root of the Eucharist is the virginal and maternal life of Mary,"
Of Perpetual Eucharistic Adoration Pope St. Pius X has said, it is "the devotion which surpasses all others." "We pay the Blessed Sacrament the supreme homage of divine adoration and worship (latria), because He who is there present is the God of heaven and earth, the all-holy Word-made-flesh, our first beginning and our last end,"
"If the poison of pride is swelling up in you, turn to the Eucharist; and that Bread, Which is your God humbling and disguising Himself, will teach you humility. If the fever of selfish greed rages in you, feed on this Bread; and you will learn generosity. If the cold wind of coveting withers you, hasten to the Bread of Angels; and charity will come to blossom in your heart. If you feel the itch of intemperance, nourish yourself with the Flesh and Blood of Christ, Who practiced heroic self-control during His earthly life; and you will become temperate. If you are lazy and sluggish about spiritual things, strengthen yourself with this heavenly Food; and you will grow fervent. Lastly, if you feel scorched by the fever of impurity, go to the banquet of the Angels; and the spotless Flesh of Christ will make you pure and chaste,"
"You may be sure that of all the moments of your life, the time you spend before the divine Sacrament will be that which will give you more strength during life and more consolation at the hour of your death and during eternity,"
"If the Blessed Sacrament is Jesus all for us, is it not the most legitimate of conclusions that we should be all for Him? We should be all for Jesus, if Jesus is our all. And what does this mean? Surely, among other things, that the Blessed Sacrament should be to us just the single overpowering fact of the world. Our hands hold Him; our words make Him; our tongue rests Him; our body compasses Him; our souls feel Him; our flesh feeds upon Him, Him, the Infinite, the Incomprehensible, the Immense, the Eternal. Must not all life be looked at in this light, just as the whole Church lies in this light and has no other?" "Without the Holy Eucharist there would be no happiness in this world; life would be insupportable. When we receive Holy Communion, we receive our joy and our happiness. The good God, wishing to give Himself to us in the Sacrament of His Love, gave us a vast and great desire, which He alone can satisfy. In the presence of this beautiful Sacrament, we are like a person dying of thirst by the side of a river  he would only need to bend his head; like a person still remaining poor, close to a great treasure  he need only stretch out his hand. He who communicates loses himself in God like a drop of water in the ocean. They can no more be separated,"
"Is not our Lord as meek and humble in the Blessed Sacrament as He was during His life on earth? Is He not always the Good Shepherd, the Divine Consoler, the Changeless Friend? Happy the soul that knows how to find Jesus in the Holy Eucharist, and in the Eucharist all things!,"
"A cloud of incense was rising on high; the people suddenly all bowed low; what could it mean? The truth flashed on him, fearfully yet sweetly; it was the Blessed Sacrament  it was the Lord Incarnate who was on the altar, who had come to visit and bless his people. It was the Great Presence, which makes a Catholic Church different from every other place in the world; which makes it, as no other place can be  holy." "Jesus is present in the Most Blessed Sacrament to complete the work which His Father entrusts to Him. He is there to fill our soul with the love which led Him to die on the Cross for us. He is there to take over our hearts and to lead us to the love of God and neighbor. He is there to make us stronger and more resolute in loving Him,"
"Our communal worship at Mass must go together with our personal worship of Jesus in Eucharistic adoration in order that our love may be complete,"
"Perpetual Adoration, Eucharistic Adoration offers to our people the opportunity to join those in religious life to pray for the salvation of the world, souls everywhere and peace on earth. We cannot underestimate the power of prayer and the difference it will make in our world,"
"What does Jesus Christ do in the Eucharist? It is God who, as our Savior, offers himself each day for us to his Father's justice. If you are in difficulties and sorrows, he will comfort and relieve you. If you are sick, he will either cure you or give you strength to suffer so as to merit Heaven. If the devil, the world, and the flesh are making war upon you, he will give you the weapons with which to fight, to resist, and to win victory. If you are poor, he will enrich you with all sorts of riches for time and eternity. Let us open the door of his sacred and adorable Heart, and be wrapped about for an instant by the flames of his love, and we shall see what a God who loves us can do. O my God, who shall be able to comprehend?" "United with the angels and saints of the heavenly Church, let us adore the most Holy Sacrament of the Eucharist. Prostrate, we adore this great mystery that contains Gods new and definitive covenant with humankind in Christ,"
"The Lord Jesus himself proclaims, 'This is My Body.' Before the blessing of the heavenly words something of another character is spoken of; after consecration it is designated 'body'. He himself speaks of his blood. Before the consecration it is spoken of as something else; after the consecration it is spoken of as 'blood'. And you say, 'Amen', that is, 'It is true.' What the mouth speaks, let the mind within confess; what the tongue utters, let the heart feel." "By our little acts of charity practiced in the shade we convert souls far away, we help missionaries, we win for them abundant alms; and by that means build actual dwellings spiritual and material for our Eucharistic Lord." The Riches of the King of kings. For me the ciborium's humble Host. For me the Cross's treasure. The joys that will last forever. "If the Christians continue to desert Jesus Christ in His temple, will not the Heavenly Father take away from them His well-beloved Son Whom they neglect?" "The adoration of Jesus in the Most Blessed Sacrament is the end of the Church Militant, just as adoration of God in His glory is the end of the Church Triumphant. A holy rivalry, a concert of prayer, a harmony of divine service should exist between the heavenly court and the Eucharistic court here below, between the adorer and his mother the Church." "We adore Thee most holy Lord Jesus Christ, here in all Thy Churches, which are in the whole world, because by Thy holy cross, Thou hast redeemed the world." "How sweet is the moment in which poor humanity, wearied and afflicted, may remain alone, with Jesus alone, in the Sacrament of Love; for there the Lord, with His flaming heart open, calls unto all, 'You that are burdened and heavy laden, come unto Me and I will refresh you.' Happy are those hearts that know how to satisfy the unquenchable hunger and thirst in this heavenly banquet!" - Fr. M.J. Corcoran, O.S.A. "If it were not for the Eucharist, if it were not for this marvelous manifestation of God's love, if it were not for this opportunity to place ourselves in the very real presence of God, if it were not for the sacrament that reminds us of His love, His suffering and His triumph, which indeed perpetuates for us His saving sacrifice on the cross, I am sure that I could never face the challenges of my life, my own weakness and sinfulness and my own need to reach out to the Living God." Together with praising Christ present in the mystery of the Eucharist, almost of necessity we recall the memory of the Mother of God. Every Holy Mass makes present in an unbloody manner the unique and perfect sacrifice, offered by Christ on the tree of the cross, in which Mary participated, joined in spirit with her suffering Son, lovingly consenting to His sacrifice and offering her own sorrow to the Father (c.f. Lumen Gentium, no. 58). Therefore, when we celebrate the Eucharist, the memorial of Christ's Passover, the memory of His Mother's suffering is also made alive and present, this Mother, who, as an unsurpassable model, teaches the faithful to unite themselves more intimately to the sacrifice of her Son, the one Redeemer. Through spiritual communion with the sorrowful Mother of God, believers share in a special way in the paschal mystery and are opened to this extraordinary action of the Holy Spirit that produces a supernatural joy because of communion with the glorious Christ, on the example of the joy granted to Mary in the glory of heaven, as the first person to share in the fruits of redemption. "The soul hungers for God, and nothing but God can satiate it. Therefore He came to dwell on earth and assumed a Body in order that this Body might become the Food of our souls,"
"The purpose of Eucharistic adoration is the Divine Person of Our Lord Jesus Christ present in the Most Blessed Sacrament. "Let us remember that Our Lord is in the Host in all his different states, and in his entirety. He who does not realize that, lives in darkness; his faith is always weak and fails to make him happy. "Let our faith be active and thoughtful; that is what will make us happy. Our Lord wants to bring us happiness all by Himself. No man can make us happy; even piety cannot do it of itself. We need a piety that has fed on the Eucharist; for happiness comes only from the possession of God."